There is a view that politics is not so much a spectrum as a circle. The conventional idea of two polarised extremes of right and left wing with a middle ground comprising of liberal conservatives and social democrats often does not work in practice. In many cases the extremes of both right and left can be so similar in their means of pursuing their ideologies that they become basically the same thing. Much of this thesis is based on the experience of the 20th century and the witnessing of the left wing dream of the Communist revolution in Soviet Russia and how it turned so completely into an authoritarian regime as controlling and repressive as any extreme right wing military dictatorship in history. Political conservatives have used the Soviet model as evidence to say that socialism could never work because of human nature. Whatever ideals we have to begin with, the view is that ” power corrupts and absolute power corrupts absolutely “. This view has been used to undermine and defeat many socialist political groupings throughout the Western world and the Labour party in the UK has been held in check by its widespread recognition. Astrology would not have a view about this theory of history apart from the general one that it is very dangerous and misleading to make all encompassing political statements because each situation is different. Every political struggle and every leader has their own chart. In order to have a good understanding of the astrology of politics we have to look at Saturn and Uranus. For millennia, the solar system was believed to stop at Saturn. The simple reason for this is that the ringed planet is the furthest one from the Earth that is visible with the naked eye and so everyone assumed that it was the last planet. As such it was always seen as the planet of limitation, the end of all things. It is a restraining influence, the only thing that prevents us flying off into the unknown uncharted territory of space. In many ways it’s obstructing influence is for our own good, its job is to teach us to recognised our limits and to work with them applying a level of focus and discipline that would ultimately enable us to grow. The positives of Saturn are all found through acceptance of limitation and hard work which in the end creates achievement. The negatives, however are numerous. When Saturn is conjunct important planets in a chart the individual can frequently accept its teaching role as it tends to work from within the person so they would be inclined towards restraint and self discipline. When Saturn is in opposition or square aspect these impositions and obstructions appear to come from the outside and other people and there is a tendency to fight against them to a much greater degree. A repressive external authority is held to blame for curtailing the individual’s freedom to act as they wish. This is an interesting take on it, because we all have to have a Saturn, without it we would be floating around in a kind of anarchic state and there would be no need for discipline of any sort. Some people, because of other features in their own charts would find it difficult to impose this discipline on themselves so therefore it has to be forced on them by others. So we blame Saturn for our troubles. Saturn has been known as the ” Greater Malefic “. Ultimately it was known as the planet of death, the Grim Reaper, the final limitation of life. In a political sense it has always been conservative and when in difficult aspect in can be a powerful force for reactionary movements. It is the planet of authority, the thing that tells us to stop. In 1781, scientific breakthroughs with the use of primitive telescopes enabled another planet to be discovered. Because this was such a radical development, Uranus has always been seen as the planet of revolution, of breaking through barriers that were previously considered impenetrable. It completely shatters all of the previous assumptions and points to new possibilities and a totally new direction in life. Uranus’ whole purpose is to destroy the assumptions of Saturn and open up new undreamt of possibilities. Whenever a new planet is discovered, the impact on the human race would be enormous. Uranus’ discovery heralded a time of immense change including the American and French revolutions. The idea of democracy as an actual method of government took hold during this period. This was also the time that the Industrial Revolution completely changed the old feudal landscape and the seeds for the emergence of socialism were beginning to be sown. Just as Saturn is the planet of the conservative right, Uranus is the representative of the left. As Saturn in difficult aspects is a reactionary force, Uranus with hard contacts would be revolutionary one. They naturally pull in opposite directions but what would happen in a chart that contained both ? The chart for the Soviet Russia, constructed for the moment that Lenin’s Bolsheviks took power in 1917 is an intriguing example. This chart has already been discussed in an article on Karl Marx, but it clearly shows both Uranus and Saturn in opposition. An opposition means that two completely opposite views or themes will have to be expressed in the life of the person or country that the chart belongs to. In the Soviet Russia chart, Uranus is in its own sign Aquarius. This is the simplest astrological symbol of the socialist ideal of the classless society where everyone lives in harmony and equality. Leo is the opposite sign to Aquarius, and it is symbolically linked to the divine right to rule of Kings. Saturn is in Leo and this represents the complete opposite to Uranus, it is an authoritarian and autocratic rulership. As individuals we all like to identify with the positive parts of our chart and we try to put all our energies in those directions. If we have oppositions, however we are forced to deal with two divergent principles. Even if we try our hardest to focus on one end of the opposition, the other planet will constantly assert itself and force us to deal with its pull as well. There is a saying ” Every stick has two ends ” and an opposition aspect is a difficult force to handle until we accept that we have to express both ends of it, however complicated that might be. Much of the Marxist theory was based on a Hegelian understanding of opposites. The creation of a bourgeois class of wealthy individuals together with an urban proletariat doing all the work meant that for Karl Marx revolution was inevitable. Two such divergent poles create a tension and energy between them that inevitably results in an explosion. In Astrology, if two planets are opposite each other and another is square to both of them we have a formation called a T Square. The tensions and challenges between the planets in opposition are forced to be expressed through the third, ( apex ) planet. 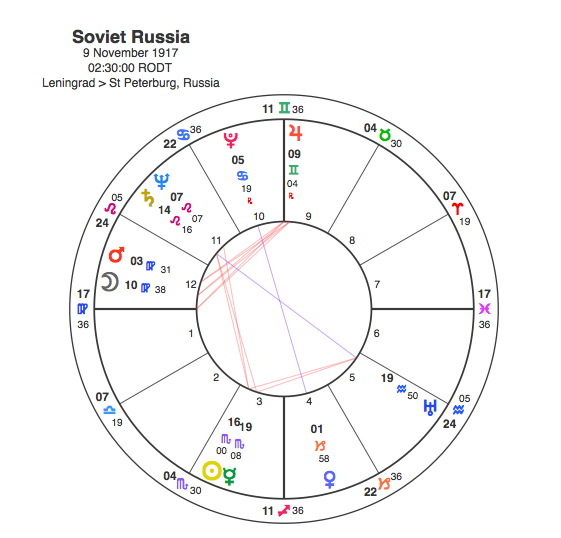 In the Soviet Russia chart this apex planet is the Sun, so the result of this challenge between the forces of reaction ( Saturn in Leo ) and socialist ideals ( Uranus in Aquarius ) is revolution ( Sun in Scorpio ). So the chart neatly explains the events of Autumn 1917. The trouble is that the chart for the Bolshevik takeover of power would also hold for the whole future of the Soviet regime, so the opposition between Saturn and Uranus that forced the revolution in the first place would continue to hold sway over the new world order. Lenin and his followers would undoubtedly want to identify with the socialist ideals and equality of Uranus in Aquarius, but would be forced to take on the authoritarian dictatorship of Saturn in Leo as well. This was rationalised by Marx’s own view that in order to proceed towards a utopian ideal, a dictatorship of the proletariat would have to be put in place to begin with. The only problem with that is that Saturn would not go away and neither would the dictatorship. Its interesting that Neptune was also loosely involved in this T square. Neptune is conjunct Saturn and although technically out of range to be opposite Uranus, it does have an impact. Neptune’s role in life and in politics is to blur the distinctions between things. Like all of the post Saturn planets it represents change, but it is change of a very unclear nature. Neptune is basically a spiritual planet whose aim is to erode the differences between mankind. It is eminently suited to the worlds of religion or arts as it brings visions and inspiration, but its role in politics seems to be largely delusory or undermining, particularly when the aspects are difficult. Neptune’s role in conjunction to Saturn in the Soviet chart seems to suggest a delusion that the dictatorship would inevitably melt away. In fact it helped to sustain the Soviet Union by creating the illusion ( Neptune ) that it was not authoritarian ( conjunct Saturn ). The Dissolution of the Soviet Union came when Pluto transited to the T square, conjunct the Sun and square to the Saturn / Uranus opposition in 1989. Pluto is a planet of revolution but unlike Uranus, it is not a political left wing force. It causes revolutions for its own sake or because that is what is required by the time. The results of a Pluto explosion can be a movement in either a right or a left direction politically. The impact however is generally more powerful than that of Uranus as it sweeps away the ground completely in order for an utterly new order to begin. Uranus revolutions are often predictable given the Saturnian conditions that existed before them. Pluto is the planet of atomic change and its revolutions are quite unpredictable as if they are quantum jumps coming from a parallel universe. So the year 1989 marked a revolution in Eastern Europe, with the Fall of the Berlin Wall and the disintegration of the Soviet Empire. Many of the old despised regimes met their downfalls but its arguable that none of these would be celebrated as much as the end of Nicolae Ceasescu. Ceausescu was a Romanian politician, an indestructible dictator for 24 years and one of history’s mass murderers. Born 3 months after the Russian revolution he was a classic example of the notion that power corrupts. The Sun in Aquarius conjunct Venus and Uranus in the 10th house would portray the popular socialist leader that Ceausescu really wanted to be. The fact that the Venus and Uranus are in exact conjunction at the apex of a Tsquare meant that he was destined for high office. There are some problems however. His Aquarian Sun is opposite the same Saturn / Neptune conjunction that was so important in the Soviet chart, so his idealism would be countered by the same authoritarian delusions. His T Square is based on an opposition between the Moon in Scorpio and Jupiter. A Scorpio Moon is the most intense and manipulative planetary placing and when its aspects are difficult, it is an indication of someone who is extremely ruthless and prepared to sink to any depths in order to get their own way. The opposition to Jupiter would simply magnify these tendencies. Ceausescu also has an exact Mars / Pluto square aspect which is probably the one most likely to result in acts of violence. 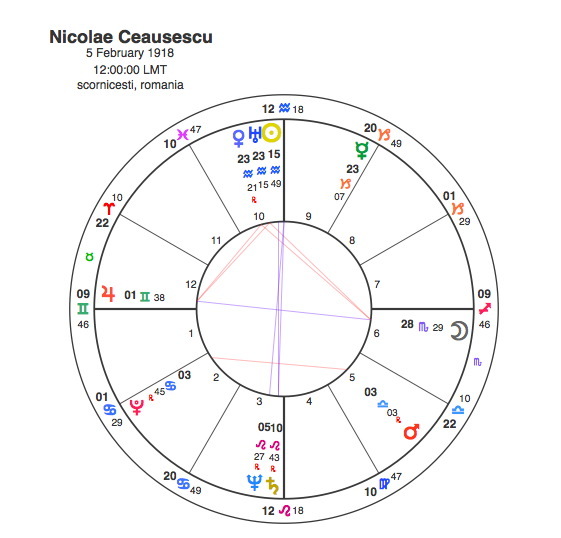 So to say that Nicolae Ceausescu was a complex character with a number of vastly different astrological influences on his character and life would be a great understatement. As always Pluto’s transits to the Sun cover the two watershed moments of his life. The first one was the opposition from 1947 – 50 when the Communists seized power in Romania in 1947, Ceausescu was made minister of agriculture, and then deputy minister of the armed forces under Gheorghe Gheorghiu-Dej, becoming a major-general. The second one was the square aspect in 1989 when his tyranny reached its end and he was overthrown and executed. It would be simple to leave it there but the other transits during his life make interesting commentaries on how a socialist idealist and anti fascist freedom fighter turned into one of the most repressive dictators in history. Ceaușescu was one of the ten children of a poor peasant family. The first transit of note in his life was Neptune’s square to his Moon / Jupiter opposition when at the age of 11, he ran away ( Jupiter ) from his abusive, alcoholic ( Neptune ) father ( Moon ). Pluto was opposite his Mercury from 1931 – 5, which brought about a powerful change ( Pluto ) to his thinking ( Mercury ). He joined the Communist Party in 1932 and was first arrested in 1933, at the age of 15 for street fighting during a strike and again, in 1934, for collecting signatures on a petition protesting the trial of railway workers The Romanian secret police already had named him as “a dangerous Communist agitator” and “distributor of Communist and antifascist propaganda materials”. Ceausescu’s chart is arranged in a way that all the major significators fall within certain areas, an 18 degree band in the Fixed signs between Saturn at 10 Leo and the Moon at 28 Scorpio. This could be extended a further 10 degrees to include Jupiter and the Ascendant. The effect of this arrangement in terms of transits would mean that a transiting planet would have an extended period of influence as it moved through the second and third decanate ( a 10 degree span ) of the Fixed signs. So such a period of time would be strongly coloured by the planet doing the transits. Therefore Ceausescu’s life would be deeply affected by these different phases. The period between 1935 and 45 was dominated by the idealistic Uranus as it transited square Neptune / Saturn and the Sun / Venus, opposite the Moon and conjunct Jupiter and his Ascendant. During this period he was constantly involved in revolutionary and anti fascist activity and spent much of the time in prisons and internment camps during the war where he shared a cell with Gheorghe Gheorghiu-Dej, becoming his protégé. The period after the war between 1945 and 1957 was dominated by Pluto as it transited opposite to his Sun / Venus / Uranus and square to the Moon. This was particularly strong in 1947 and 48 as Pluto and Saturn were opposite the Sun. Pluto and Saturn are essentially about power so its no surprise that the left wing antifascist rebel was given his first taste of office and respectability under this transit. The Communists seized power in Romania in 1947 and Ceausescu was head of the ministry of agriculture, then served as deputy minister of the armed forces under Gheorghe Gheorghiu-Dej, becoming a major-general. In 1952, Gheorghiu-Dej brought him onto the Central Committee months after the party’s “Muscovite faction” led by Ana Pauker had been purged. In 1954, he became a full member of the Politburo and eventually rose to occupy the second-highest position in the party hierarchy. Pluto was square his Scorpio Moon in 1955 when he was made a full-time member of the Politburo, and was soon managing the party’s organization structure and cadres. So Pluto’s transits had marked the full transition from revolutionary to pillar of the establishment and a position of great power in Romania. The next planet to transit the main part of his chart was Neptune between 1964 and 1975, square his Sun / Venus / Uranus , conjunct his Moon and opposite Jupiter and Ascendant. When Neptune was square his Sun in 1965, Gheorghiu-Dej died and Ceausescu was elected general secretary. He was not the obvious choice but amid widespread infighting among older and more connected officials the Politburo turned to Ceaușescu as a compromise candidate. The Neptune period was intriguing as there was a constant shifting of position which made Ceausescu’s regime more amenable to the Western powers and had the effect of creating some distance between Romania and Soviet Russia. Ceausescu created a distinct national identity for Romania but it was all part of consolidating his position. So despite his appearing to be more open in foreign policy terms the net effect of this period was to set up the conditions that created his own dictatorship. One of his first acts was to change the name of the party from the Romanian Workers’ Party back to the Communist Party of Romania, and declare the country a socialist republic rather than a people’s republic. In 1967, he consolidated his power by becoming president of the State Council (head of state). A series of official visits to Western countries helped Ceaușescu to present himself as a reforming Communist, pursuing an independent foreign policy within the Soviet Bloc. Whilst this appeal to the West was going on however, Ceaușescu had become particularly interested in the cultural national transformation of North Korea and China. He was also inspired by the personality cults of North Korea’s Kim Il-sung and China’s Mao Zedong. In July 1971, he issued the July Theses which proposed the continuous growth in the “leading role” of the Party, improvement of Party education and of mass political action, youth participation on large construction projects as part of their “patriotic work”, an intensification of political-ideological education in schools and universities, as well as in children’s, youth and student organizations and an expansion of political propaganda, orienting radio and television shows to this end, as well as publishing houses, theatres and cinemas, opera, ballet, artists’ unions, promoting a “militant, revolutionary” character in artistic productions. An index of banned books and authors was established. This is the problem with the difficult aspects of Neptune. Something that can appear to be highly inspiring and idealistic can in fact be very deceptive and result in the exact opposite. The Theses heralded the beginning of a “mini cultural revolution” in Romania. Although presented in terms of “Socialist Humanism”, they marked a movement towards a strict ideological conformity in the humanities and social sciences. Culture became an instrument for political-ideological propaganda and hardline measures. In 1974, Ceaușescu made himself President. Although he had been head of state since 1965, he had merely been first among equals. The new post, however, made him the nation’s top decision-maker who could appoint and dismiss the president of the Supreme Court and the prosecutor general. From Neptune’s opposition to his Ascendant in 1974 onward Ceaușescu basically ruled by decree. Between 1982 and 84, the hardline position was reinforced by another Saturn transit, this time square his Sun / Venus / Uranus conjunct his Moon and opposite Jupiter and the Ascendant. Under this influence Ceaușescu’s regime became increasingly brutal and repressive. His secret police maintained strict controls over speech and the media, and internal dissent was not tolerated. In 1982, with the goal of paying off Romania’s large foreign debt, Ceaușescu ordered the export of much of the country’s agricultural and industrial production. The resulting extreme shortages of food, fuel, energy, medicines, and other basic necessities drastically lowered living standards and intensified unrest. Ceaușescu’s regime was also marked by nepotism and many of the senior posts in Romania found their way into his family’s hands. During the early days of the Russian Revolution there was much debate about whether it was possible to establish ” Socialism in one Country ” or whether the whole world would have to to join in because the idealistic system could be easily undermined by foreign powers. In Ceausescu’s Romania there was a joke about the President establishing ” Socialism in one Family “. Even at this peak of personal power the seeds of Ceausescu’s downfall were discernible. A coup d’état was planned in October 1984 but failed when the military unit assigned to carry out the plan was sent to harvest maize instead. If Saturn’s transit had established a real authoritarian power base for Ceausescu, Pluto’s second appearance took it to a level of obscenity that brought about his downfall. Pluto came to square Neptune and Saturn in 1986 to 88. Under this influence food rationing was introduced and heating, gas and electricity blackouts became the rule. During the 1980s, there was a steady decrease in the Romanian population’s standard of living and Ceaușescu shut down all radio stations outside of the capital, and limited television to one channel broadcasting only two hours a day. Ceausescu was out of step with the developments in Russia. He was firmly against glasnost and perestroika and the Soviet leader Gorbachev made no secret of his distaste for Ceaușescu, whom he called “the Romanian führer.” Gorbachev told Ceausescu “You are running a dictatorship here”. The forces of opposition were increasing not just in Romania but throughout Eastern Europe and the fall of the Berlin Wall in November 1989 and the domino effect throughout the Communist bloc was triggered by Pluto’s conjunction to the Soviet Russia Sun. Pluto was also square Nicolae Ceausescu’s Sun so his days were numbered. The regime collapsed after he ordered his security forces to fire on antigovernment demonstrators, killing and injuring men, women and children, in the city of Timișoara on 17 December 1989. The demonstrations spread to Bucharest and became known as the Romanian Revolution, which was the only violent overthrow of a Communist government during the revolutions of 1989. Ceaușescu and his wife, Elena, fled Bucharest but were captured by the armed forces. On 25 December the couple were hastily tried and convicted on charges of genocide and sabotage of the Romanian economy. They were both executed by firing squad. With the Sun conjunct Uranus in Aquarius opposite Saturn and square the Moon in Scorpio it’s possible for one man to be both freedom fighter and repressive dictator. The transits of Saturn, Uranus, Neptune and Pluto showed the transition from one extreme to the other. Uranus showed us the anti fascist rebel, Saturn pointed to the authoritarian leader, Neptune showed how the transition from one to the other was veiled with idealistic deception and Pluto, as usual, took the whole thing to extremes and finally finished him off. Nicolae Ceausescu’s life confirms the saying in politics that ” Saturn power corrupts but Pluto power corrupts absolutely “.